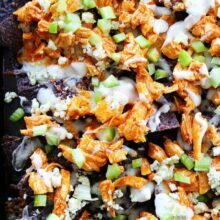 Loaded Sweet Potato Nachos-perfect snack for game day or any day! I have been on a major sweet potato kick. I have been making Baked Sweet Potato Fries almost every single day for lunch. I eat them hot off the pan. Who needs a plate? Over the weekend, we were watching football and Josh suggested we make nachos. Nachos sounded good, but not the chip part. I wanted my pan of sweet potatoes for lunch. I had the most brilliant idea ever. I told Josh to make Sweet Potato Nachos! Since I am pregnant and because Josh loves me, he went along with my idea and made a big pan of Loaded Sweet Potato Nachos! Josh cut the sweet potatoes into rounds, so they resembled chips. He used a mandoline slicer so all of the sweet potato rounds would be the same size. If you don’t have a mandoline, no worries, you can use a knife. Josh roasted the chips until they were crispy. He pulled the pan out of the oven and smothered them with cheese and black beans. He put the pan back in the oven so the cheese could melt. He topped the cheesy sweet potato nachos with green onions, cilantro, avocado, and sour cream. He wanted to add jalapeño slices, but I put my foot down…and since I am pregnant, I get my way:) I didn’t want to have heartburn for the rest of the day! If you don’t have to worry about heartburn, I am sure jalapeño would be a nice addition! Loaded Sweet Potato Nachos are my kind of nachos. They were everything I hoped for and MORE! I am obsessed! I want to eat them for every meal! 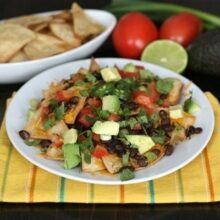 If you are looking for a killer Super Bowl snack, make Loaded Sweet Potato Nachos! They are perfect for game day…or any day. I can’t wait until the big game to make them again! I might make them every day until Super Bowl Sunday. I just hope I don’t turn orange! 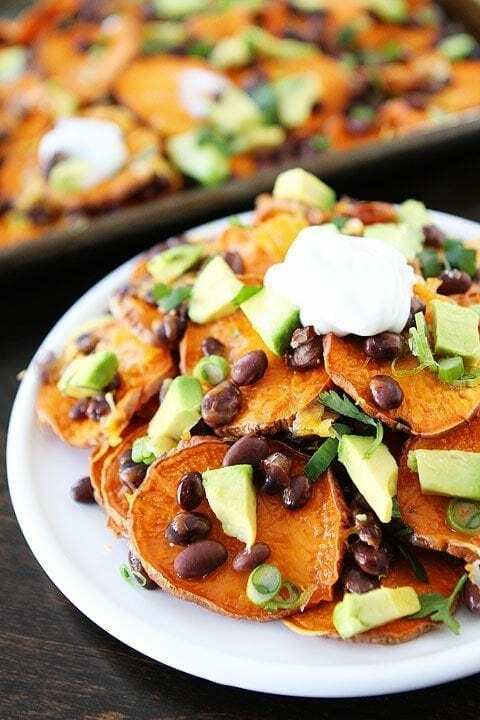 Loaded Sweet Potato Nachos are the perfect game day snack! Load them up with your favorite nacho toppings! Place the sweet potato rounds on a large baking sheet. You might need two baking sheets if you run out of room. You don't want to overcrowd the sweet potatoes. Toss the sweet potatoes in olive oil and season with salt and pepper. Bake for 20 minutes. Use a spatula to flip the sweet potato rounds. Bake for an additional 10 minutes or until sweet potatoes are crisp. Remove pan from oven and top with green onions, cilantro, avocado, and sour cream or Greek yogurt. Serve immediately. I love how chip like your sweet potatoes were. The whole dish looks amazing! YUM! OH EM GEE. I need to make these! I love sweet potatoes and I love nachos! Best of two worlds brought together!! Great idea! Girl, you have one smart pregnant brain…I mean, sweet potato nachos?! This is GENIUS! Your hubby was totally right to go along with this. These look fan-flipping tastic and I want to face plant right into the center of a big pile ‘o these! 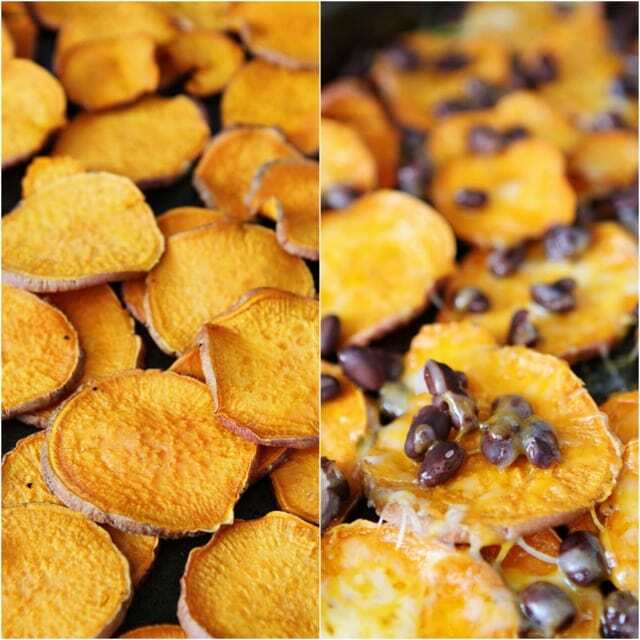 I love sweet potato chips and making them into Nachos! Perfect! Great snack! It’s okay if you turn a little orange. It’s winter and we all could use a little color, right? 😉 These look great! Looks deeeee-lish! What a fun take on sweet potatoes too. I just pinned AND I’m so gonna make soon! Thx for a great recipe. We had one of those insights last night, too. We made sweet potato pizza. Half the sweet potatoes, roast cut side down, then top with cheese and broil for a few minutes. I had never thought of using sweet potatoes that way before. Woohoo! Look at those gorgeous nachos! Love them! Now these are my kind of nachos! Love them! One of the best parts about being pregnant – you always get your way especially when it comes to food! Such a great idea! Nachos are the best party food because everybody loves nachos. Looks amazing! I could totally nosh on these! A nice recipe. Thanks so much and Happy Wednesday! Amazing! Just when I thought sweet potatoes couldn’t get any better! Making these this weekend for sure! Love this idea! I’m a big fan of sweet potato fries too, and who doesn’t like nachos? Getting rid of the chips is a great idea. Love baked sweet potatoes but have not tried the fries and these nachos sound good. My husband will not eat them. 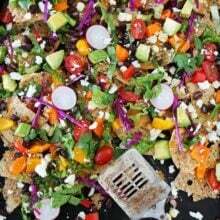 Now these are guilt free nachos!! Delicious! these looks so great, and I love how healthy they are! Such creative nachos, they look amazing Maria! Sweet potato nachos sounds so much fun. Love it! 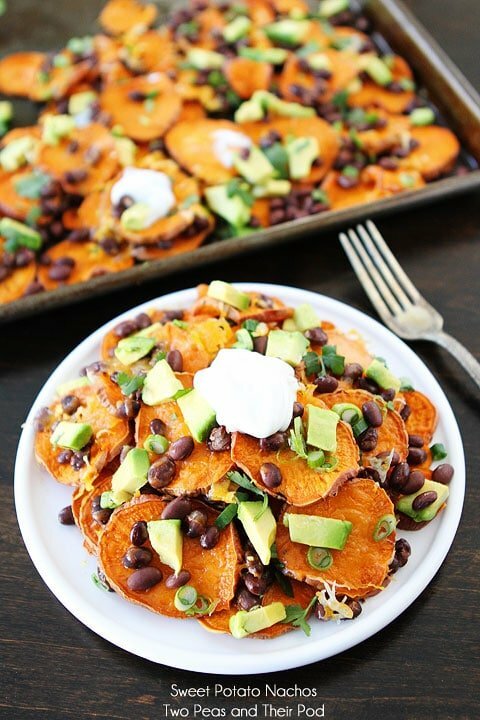 These sweet potato nachos look amazing and healthy! Delish! 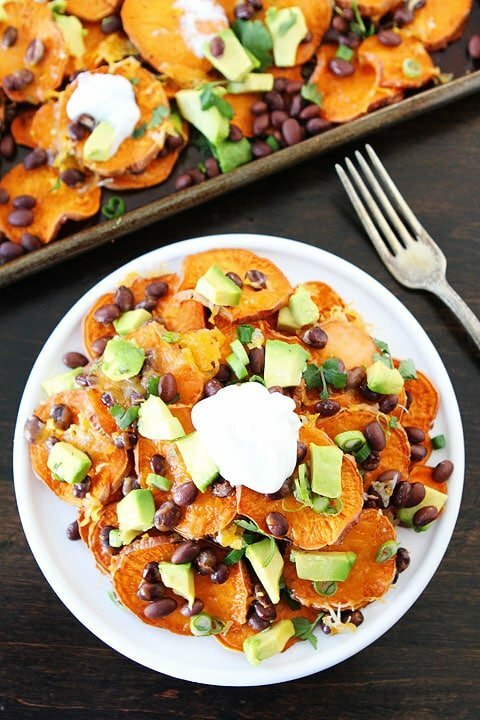 oh my gosh, sweet potato nachos?! this is seriously the best football app ever!! Well, I know firsthand how delicious these are, because I’m building a whole small business on it! My company’s called Yummy Yammy, and I started here in my Vermont kitchen… I make sweet potato salsas… there are Mexican ones (mild/med/hot) with black bean, corn, and chipotle; Tuscan one w roasted red pepper, white bean, basil; and a Moroccan one, with curry lentil and kale. It is so fun to play around with sweeties. I’m so happy when I find other sweet potato lovers… happy day to you, and I hope all goes great with your pregnancy! Bound to be a healthy babe! This looks perfect! I love the flavour!! Yum! 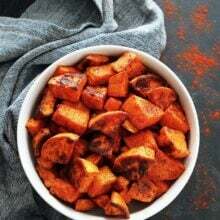 I am so going to have to try these – I love sweet potato fries too! You definitely deserve to get your way since you’re pregnant! Can’t wait to try this recipe. Sweet potatoes and avocados are my favorite foods. True story-I was trying to explain to my husband today how crazy my pregnancy cravings have been. For the past two weeks, all I’ve wanted is nachos, but I’m also on a massive sweet potato kick. I told him that we’re making sweet potato chips smothered in ground beef, salsa, and guac this weekend. 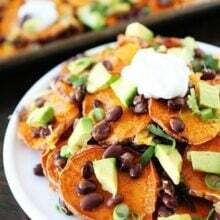 And since I’m non stop hungry, I googled sweet potato nachos to curb my cravings and found your recipe. I love it! Thank you, Josh! I made these for dinner & topped with Pumpkin-spiced Salsa. They were delicious! Congrats to the whole family on the new “pea”. This looks amazing! 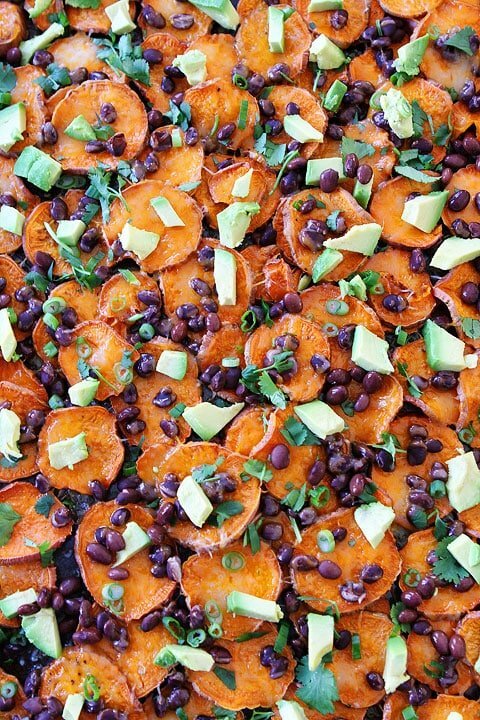 Three things I have become addicted to – sweet potatoes, avocado and black beans all in one dish! You’re officially my kitchen hero! Isn’t Josh the sweetest guy ever to make these amazing nachos for you! Delicious!! Sweet Potatoes have been calling my name forever! What a much better idea for nachos! We loved these! They were a major crowd pleaser. My husband is currently scraping the baking sheet. Kids (5.5 and almost 3) enjoyed these as well. This is something that we will be making again soon- like tomorrow!!!! Thank you. Yay! So glad you liked them! I am obsessed! I made these last night. Super quick to whip up and really yummy. I tossed the potatoes with some cumin and chili before popping them in the oven. Added a yummy kick! Thanks for sharing. Congratulations! Isn’t it wonderful when you give into those cravings? Pregnancy cravings can be intense! I love this idea! I’m pinning these to make later! Thanks! Yum! What a great new take on nachos! Ok, I love this idea! Absolutely love it. I am a huge sweet potato nut!!! I don’t know if my husband would go for this but I think it is genius! Don’t know if I would make nachos the other way again. Maria – I made these last night for my meat-loving husband last night and he went back for seconds!! I may never eat nachos with corn chips again!! Yay! I am glad your husband liked the nachos! What a great idea! I made this for dinner tonight and added a few more of our favorite nacho ingredients and spices. My husband said that I need to double the recipe the next time I make it. It’s a winner for us! Made it tonight…it was great!!! I’m excited, I have all those items in the house right now…..yum! Thank you so much for this creative recipe! It was a hit! I love all of your recipes. I think every time I have found a recipe that I like and open it, what a surprise it turns out to be you two! So I belong to this group and we trying to be healthy and so i found this recipe and I am going to try it out.. There is one thing I was wondering are the sweet potatoes a bit cooked first or are they uncooked so that you can slice them? I’m a nacho fan and am excited to make these…. I don’t cook the potatoes first, just slice them and then put in the oven! Enjoy! Should there have been a #3 in the directions or is it misnumbered? I read not all but a lot of the post but did not see any comment on #3 missing. Sorry! I updated the post. I just messed up the numbers! While these looked and sounded like a grain-free girl’s miracle …my 2 bath he’s would not crisp up. Not at a higher heat and not with more time. I followed the 1/4 inch thickness but no luck. I ended up mashing the mushy potatoes. Tried these. Love them!!!!!!!!!!!! eat them almost every week. Thank you so much. You are so welcome! They are my favorite too! Pingback: The Best 7 Day ‘Budget Friendly’ Flat Stomach Meal Plan! My whole family would love these. Such a great idea! I think I will be making these but adding some spices or taco seasoning! Thanks for all the great recipes! Yum. I can’t wait to work with you!! We added shredded chicken. Wonderful!